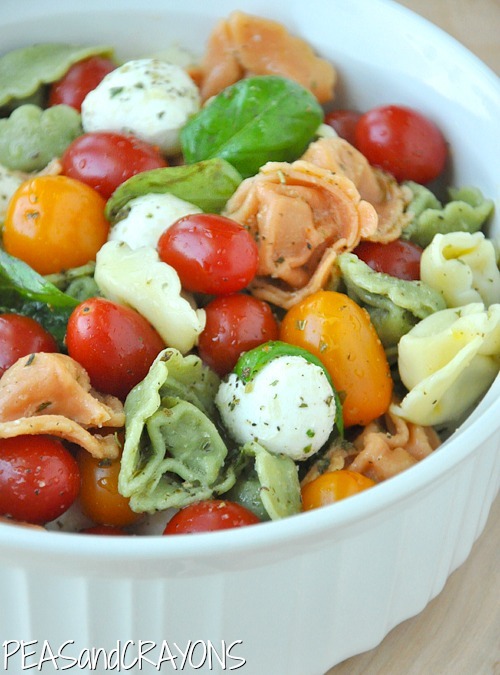 Caprese Tortellini Pasta Salad - Make-Ahead + Totally Delicious! 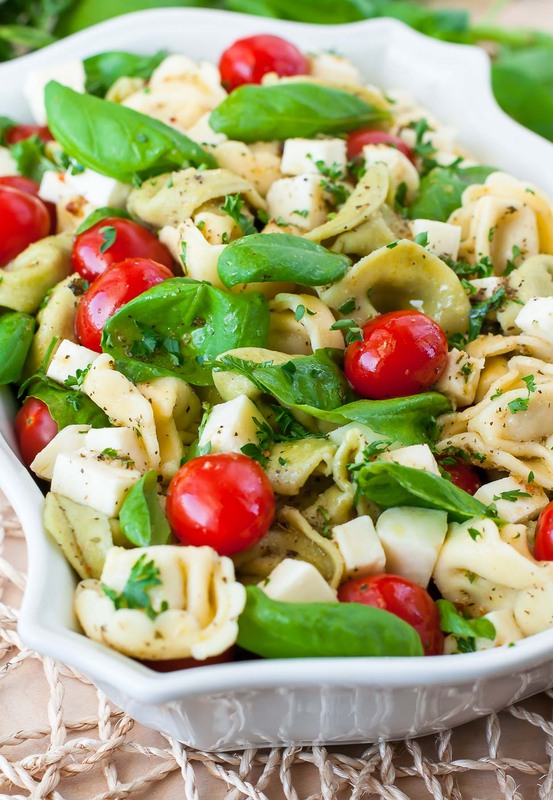 This caprese tortellini pasta salad is ready to rock your next party or BBQ! Feel free to make this healthy pasta salad in advance – it’s great the next day! Fresh tortellini went on sale again and my basil plant decided to turn into the incredible Hulk of herbs so… let’s have some fun with it! 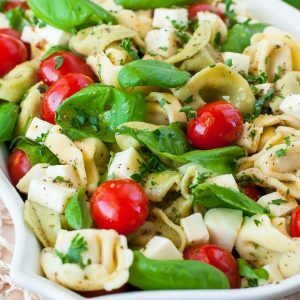 This caprese tortellini salad is the perfect delivery system for a whole lot of YUM! When the classic flavor of a fresh Caprese salad combines with tender, cheesy tortellini pasta, puremagic happens. The weather is still a bit wonky, flashing from freezing and rainy to hot and sunny in the blink of an eye, but this salad is sure to have your taste buds singing “SUMMER!! !” and doing a little jig. One bite of this fresh, flavorful salad and you’ll know exactly what season it is. Get ready to enjoy this one all Spring and Summer long! I’m jumping right into the recipes today since I have a whole lot of YUM to squeeze into just one post! You don’t mind, right? This caprese pasta salad serves 4 and is very easily doubled or tripled to feed a crowd! Take this tasty tortellini to your next barbecue or potluck for an uber easyy crowd-pleasing dish! Short on time? You can even make it in advance for a grab and go side dish that’s sure to delight. Squirrel away a portion of the dressing to toss the salad in just before serving and get ready to faceplate! Just when you thought pasta salad couldn't get any better: This caprese tortellini pasta salad is ready to rock your next party or BBQ! Add your tortellini and reduce heat to gently cook the pasta to either tender or al-dente according to package directions. Grab a noodle to taste-test and remove from heat. Strain/drain in a colander and run under cold water to halt the cooking process and prevent soggy noodles. Transfer into a medium-large serving bowl along with mozzarella balls, tomatoes, and basil. FOR THE DRESSING: whisk all ingredients together and allow to sit. Giving the dressing some time to mingle will not only infuse flavor into the oil/vinegar but also soften the dry herbs and seasoning. This dressing will keep in your fridge for about a week so make extra to drizzle over a week's worth of salads! Pour in dressing and toss to coat. The above measurements are simply a jumping off point; use as much or as little as you need! <3 This dish comes together in a matter of minutes and is perfect for a last minute meal or an impromptu side dish for a summer BBQ or party! If your local grocery store has an antipasto bar with fresh marinated mozzarella balls, those will work gloriously too! You can even use a regular block of whole milk mozzarella cheese and marinate it in some extra homemade [[or even store bought!] Italian dressing if you'd like! It's super customizable and so delicious! Feel free to drizzle your favorite fruity balsamic dressing or glaze over this salad for an extra burst of flavor! Skip the bowl and kebab it up for a fun snack or party appetizer! Of course if we’re going to slap this salad on a stick, then we’re going to need something to dunk it in… right? Combine ingredients in a food processor and blend until creamy. Feel free to add a little extra salt or pesto if your tastebuds crave it. The cheese will thicken the dip while the cucumber and vinegar will thin it; adjust if desired. The measurements above are my own personal magical OHMYGOSH-I-LOVE-THIS-DIP ratio. It’s downright delicious with tortellini kebabs, fresh veggies, whole grain crackers, and even rocks as a sandwich spread! Store an extra batch in your fridge so you can try it on everything! 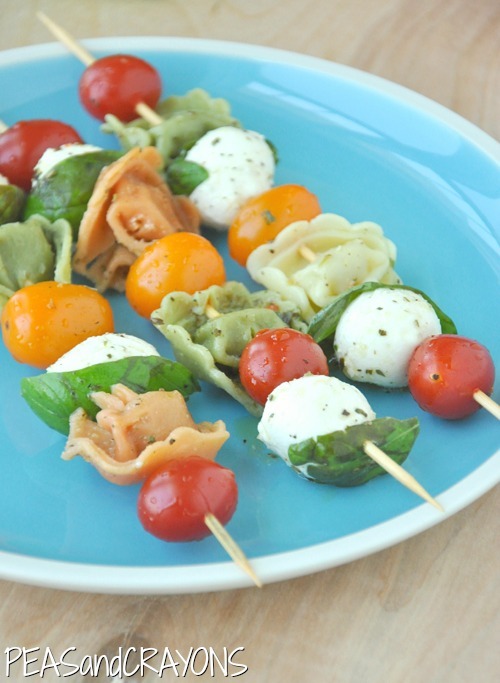 If you get a chance to try this easy peasy Caprese Tortellini Pasta Salad let me know! looking for a few more ways to pasta your salad? I added cooked shrimp. Next time I will add less Mrs Dash. Love the addition of shrimp! Thanks Judith! All look super delish! Just made…and we devoured the Caprese Tortellini Pasta Salad- sooooo good! The kebab idea is fantastic!!!! Yes! To all of it! 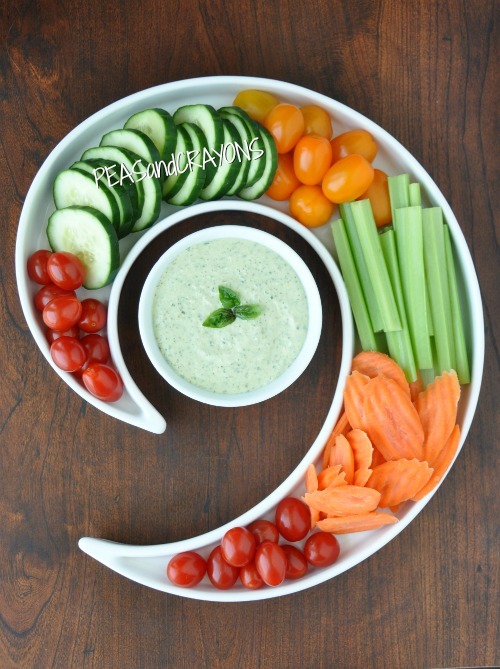 I love the idea of this creamy pesto dip. I already made the pesto yesterday so now I just need to make the actual dip. I’m also thinking about freezing some of the final product because I want to have this stuff handy all summer long! I hope it works. I made the creamy pesto dip, and I don’t care that it’s 5 in the morning, I want to lap this dip up with a spoon. Normally, I love my veggies, but I could eat this plain. Soooo amazing. You have outdone yourself. Eating off of skewers is so much fun 🙂 We like to make fruit skewers for BBQs and I want to make a fun sweet dip to go along with it. Maybe something with peanut butter or cream cheese! I will totally be stopping by tomorrow for that blueberry biscuit recipe. Looks SO good!! I have a great blackberry balsamic that would be good with the first recipe! That little dip and veggie set is so cute. Do you remember where you got it? I really need to get one. you had me at caprese!!! I need to make all of this. They look absolutely amazing! This looks amazing! You take such great pictures. Can’t wait to try this out. Mmmmmm…the tortellini pasta salad looks soooo good! This would be perfect to make for a BBQ I’m having next month. I saw this pic on Instagram yesterday and seriously kind of drooled. Having just finished my bike ride didn’t help. 😉 I’ve eaten a variation of caprese salad about 3 times in the past 1 1/2 weeks. I’d say this is another good variation to bring to the table! GET IT?! But seriously. Thanks for sharing/posting! I love that you made this post into so many different options! They all look delicious! Why is food always more fun on a stick?! Love this. Love YOU! Oh I love the kabobs – such a fun idea! This dip. I die. That’s all. Those tortellini kabobs are genius!! What a perfect appetizer to bring to a bbq!